Celebrating Imaging Innovation (L-R): Jim Malcolm, IA president; Michelle Tramantano, IA program director; Benjamin Von Wong, Visionary Photographer; Jerry Grossman, IA executive director; Visionary Photographers Corey Rich and James Neihouse; Adorama’s Danielle Lawler; Drew Geraci, Visionary Photographer; Adam Mirabella, IA vice president; Best Buy’s Marie Grable; and Glazer’s Rebecca Kaplan and Ari Lackman. 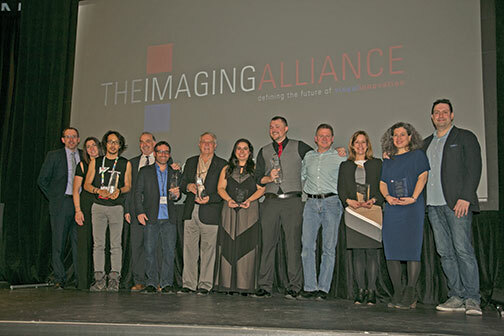 Las Vegas, NV—The recently formed Imaging Alliance (IA) celebrated imaging innovation and vision on January 4, 2017. The gala awards event was held at Foundry Hall in the SLS Las Vegas Hotel and Casino. More than 200 industry executives, photographers, investors and start-up companies paid tribute to Benjamin Von Wong, Corey Rich, Drew Geraci and James Neihouse—the 2017 recipients of IA’s Visionary Photographer Awards. 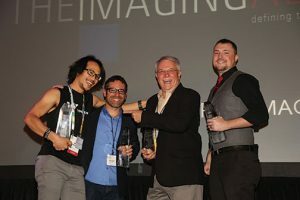 Retailers Glazer’s Camera, Adorama and Best Buy were also honored for their vision and creativity in imaging retailing. Following the performance, Imaging Alliance president Jim Malcolm welcomed the crowd. He then explained the genesis of the Imaging Alliance, along with its vision for the future. Malcolm then welcomed National Geographic’s Claudia Malley to the stage. Malley presented her company’s broad approach to imaging content, as well as new programs that are being offered to showcase the power of imaging. 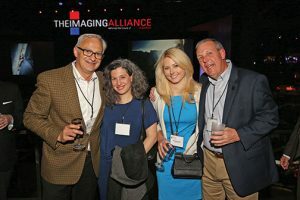 Jerry Grossman, IA executive director, then spoke about the importance of philanthropy in the imaging industry and the many opportunities members have to give back through imaging. Celebrating imaging innovation at the Imaging Alliance’s 2017 awards gala are (L-R) Alex Christianian, Mike’s Camera; Rebecca Kaplan, Glazer’s Camera; Kristin Long, Panasonic; and Gregg Burger, Precision Camera. Grossman went on to showcase Portraits of Love, a program that offers free family portraits to military families. He also spoke about the Imaging Alliance Salutes Photographers Who Give Back. This program honors photographers who use their talents to support social causes. The Imaging Alliance will be launching a pilot for a school program in the spring. The first recipient, Benjamin Von Wong, showed a video that displayed his hyperrealistic style that captures viewers in a fusion of special effects and innovative concepts. Corey Rich then presented his video production. Rich has worked in everything from photojournalism to documentaries, as well as high-production commercial projects for major companies. He has created outdoor lifestyle/adventure still and motion storytelling in some of the most dangerous locations on the planet. His body of work over the last two decades proves that it is not only possible to achieve Hollywood-grade results with a “small-footprint production” model but that it often produces better, more authentic visual stories. 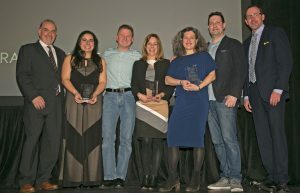 Winners of the Imaging Alliance’s first Visionary Retailers Awards celebrate with IA board members. Pictured (L-R): Jerry Grossman, IA executive director; Danielle Lawler, Adorama; Adam Mirabella, IA vice president; Marie Grable, Best Buy; Rebecca Kaplan and Ari Lackman, Glazer’s Camera; and Jim Malcolm, IA president. The first Visionary Retailer Awards went to Best Buy, who was recognized for its commitment to the imaging category with it new Camera Experience Shops that are now in 130 locations nationwide; Adorama, whose online Adorama Learning Center offers professional-grade video tutorials, online social events and AdoramaTV series, bringing an exciting focus to the imaging category; and Glazer’s Camera, which recently opened a state-of-the-art location in the heart of downtown Seattle. “The sheer fact that the management of Glazer’s chose to invest so much in the new store, combined with their belief in the future of brick-and-mortar retailing in our industry, is an inspiration to the imaging industry,” said Mirabella. Jerry Grossman returned to the stage to present the final two Visionary Photographer Awards. James Neihouse, who has worked on more than 30 IMAX films and other large formats, was given the next award. His first credit as director of photography was on the film The Eruption of Mount St. Helens, which was the first IMAX to be nominated for an Academy Award. He has contributed to some of the most successful films in the format. These include The Dream Is Alive, Space Station 3D, Hubble 3D and Ocean Oasis. 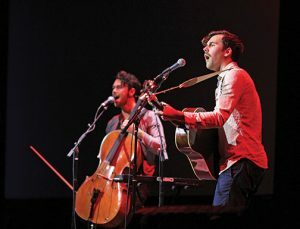 His most recent project, A Beautiful Planet, was released last April. Drew Geraci then accepted his Visionary Photographer Award. A passionate photographer/videographer, Geraci specializes in motion time-lapse photography, video production and aerial videography. He is also the owner of District 7 Media. His work, including the iconic opening sequence to Netflix’s House of Cards, displayed an amazing array of time-lapse photography that astonished the audience.